While in Japan as my contract winded down I planned to do one brief trip before going back to Canada and back to school at UBC to do my MBA. 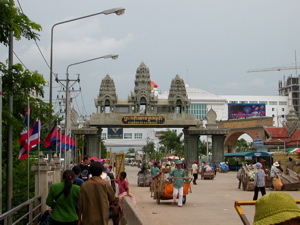 I decided to go to Cambodia and I decided to go overland. I followed the advise I found on the website and like their webmaster I recommend flying to Siem Reap rather than busing overland. You'll save yourself a whole day and it won't cost terribly much. 6:00 Am got up and packed showered and walked to Khao San road Ate breakfast waited for the pick up at 7:30. Pick up was slightly late then only drove me three blocks to a big Mercedes bus that departed at 8:00 am promptly. The bus had a bathroom but it was a bit dodgy, it was AC though. We briefly stopped at 10:30 for unexplained reasons. 11:30 Arrive at the Siam Guesthouse. Official story: 40 minute break for lunch and to get your visa. I had mine. They charged 1200 Baht and would take your photo if you did not have it. Food cost was comparable to Khao San Road. 12:26 Back in the Air Con bus. 12:43 in line on the Thai side of border. The line is long. 2:05 On the Cambodian bus it is the Korean bus (writing on side) but is a Toyota, aircon no bathroom. We only drove a few blocks were we are given a story about changing money I later learned the rate was 3400 riel to the dollar. I just waited. Then we change buses drive another block to a waiting area. There are people from another bus/tour that were in line with us. No reason is given why we are here. There is a video playing, the place has a bathroom. At 3:09 we board the new bus. It is old and leaks with no AC. 5:06 we reach a restaurant "half way" The food wasn't good and despite the story they take Baht, Dollars and Riel. The exchange rate here is 4000 riel to the dollar and 100 Riel to the Baht. 5:43 out of the restaurant. At 8:30 I abandoned everyone, liberating my own bag from the bus and walked 45 minutes back to Earthwalkers in the dark. We were dropped off near Peace of Angkor, but the actual spot was two places down something like Pharanha Angkor, I didn't write it down. I ignored the waiting Tuk Tuks and other Guesthouse people and persistant motobike drivers and walked 45 minutes straight back to Earthwalkers. I was mocked for timing the distance between where we ended up and where I wanted to be and no one seemed to think much of me bolting as soon as we stopped. But I was happy when I arrived at Earthwalkers, though I haven't had the best of times in South East Asia so far.